The National Oceanic and Atmospheric Administration makes the data from their many tide monitoring stations around the continent available for download. One way to access these data is through NOAA’s Center for Operational Oceanographic Products and Services (CO-OPS) website, which provides several access methods including an OPeNDAP server. The OPeNDAP server allows you to construct a fairly simple URL query to submit in a web browser, and it will return the requested data as ascii text. The basics of making an OPeNDAP query are explained here, but you can probably just figure out how it works from the code below and by visiting the CO-OPS OPeNDAP server linked above. Some NOAA tide stations also record water temperature, air temperature, wind speed, wind direction, and conductivity, all of which could be accessed through the OPeNDAP server. I wrote the following R script to build up an OPeNDAP query, submit it to the CO-OPS server using the RCurl package, and then parse the resulting text into a data frame that can be saved to disk. The R script is available in my GitHub repository. Either copy that script to your clipboard (there’s a button to do so) and save it on your computer, or navigate to the main repository page (Misc_R_scripts) and download everything as a zip file. 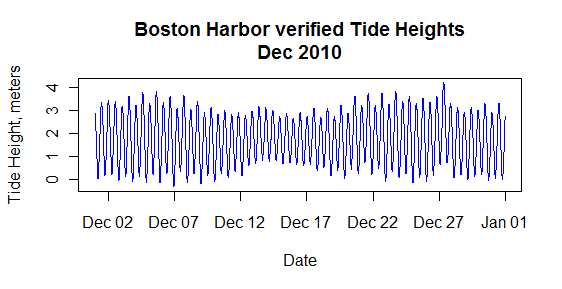 When you’re downloading 6-minute verified tide height data, the server will only let you retrieve 1 month’s worth of data at a time. You can only access 6-minute verified data that is older than 2 months. To find your local tide station, try the http://opendap.co-ops.nos.noaa.gov/stations/index.jsp site or the main NOAA Tides and Currents webpage. Edit July 2011: I have also put together a stripped-down version of the above script that will automatically step through a set of specified years and download the tide data for each month into separate files. That script is available on GitHub as well. If you want to get several years’ worth of data all at once for a single site, use that script. # Scroll through that list to find your station ID. # water temperature, air temperature, wind etc. # for accessing other data types from NOAA CO-OPS. # The tide height is reported in meters and time in UTC (Greenwich). # Do not change any values here, do not insert your own values here. #Save data automatically to a .csv file. I stumbled across the Pretty R site at some point on http://www.r-bloggers.com.